Everyone who visits the Pinellas County parks seem to be fascinated, yet scared of the alligators. They imagine 20 ft reptiles that lay hidden in wait for unsuspecting creatures and attack suddenly, at least that is how it happens in the movies. In the winter the alligators become less active. They might have a burrow on the bank of a river, above the water level, or an alligator hole below the water. They can lay at the bottom of water and still survive, as long as it is no cooler than 40 degrees. If the pond freezes, they might float up to the top where their nostrils can breathe. Then, when the ice melts, they can swim free. As they cannot breathe underwater, even in winter they have to come up for air at least once an hour. Alligators are most active when the temperatures are between 82 and 92 degrees usually during the summer months and between dusk and dawn. Alligators rarely eat until it is at least 70 degrees, and then only once a week, often at night when they can be identified by the red, glowing eyes. They can last up to 2 years on the fat stores in their tale. 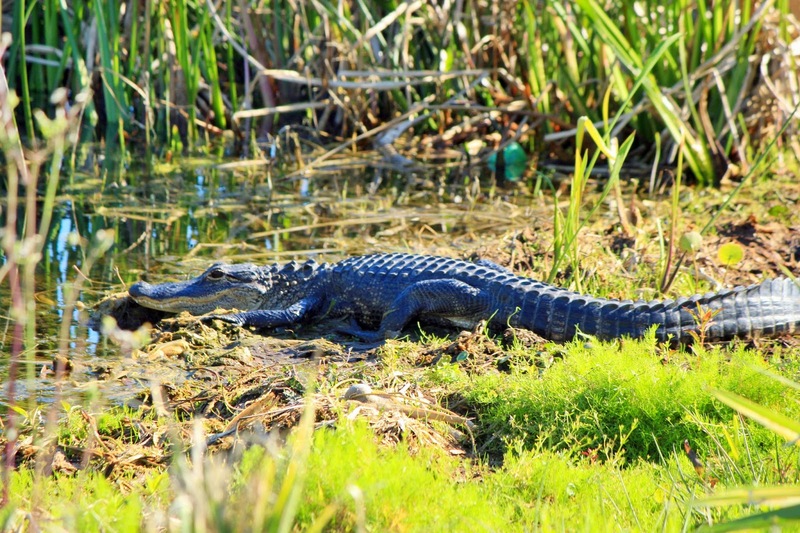 You might see birds walk right by an alligator on even a warm day, but they remain motionless. Alligators mostly eat fish, turtles, water birds, snakes and other alligators. 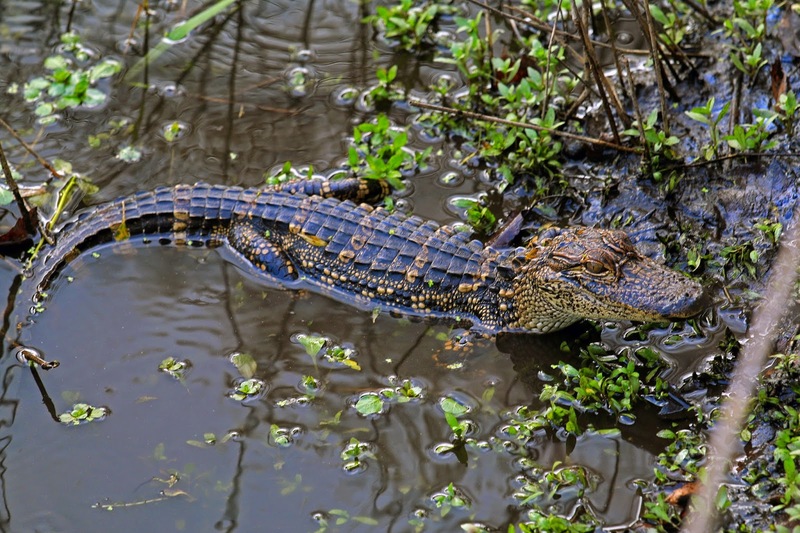 Young alligators eat snails, insects, spiders, worms and larvae. 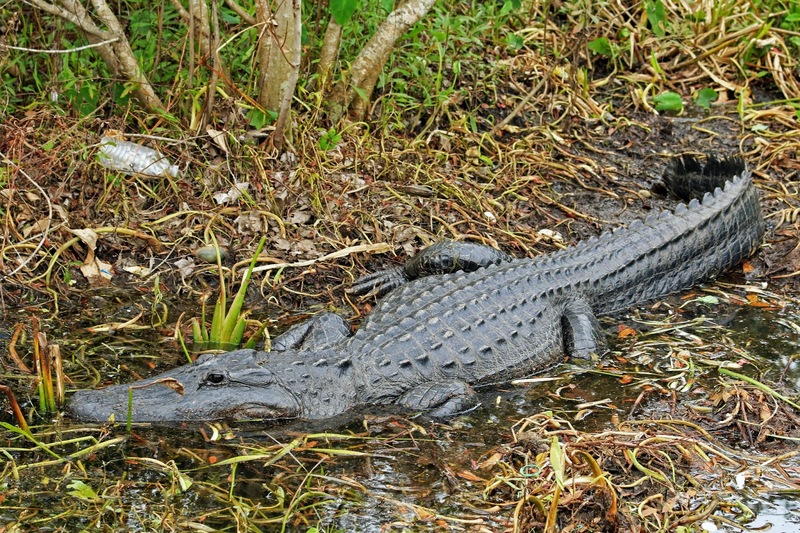 It takes 9 to 14 years for an alligator to reach 6-7 feet, which is considered adulthood. The larger the gator, the more likely he will occasionally eat bigger mammals like raccoons, small dogs, cats, etc. On a warm night he might venture up to 170 ft from the water and attack prey on land, but it would have to be a huge gator to attack a rare deer, wild boar, bear, bobcat or a human. 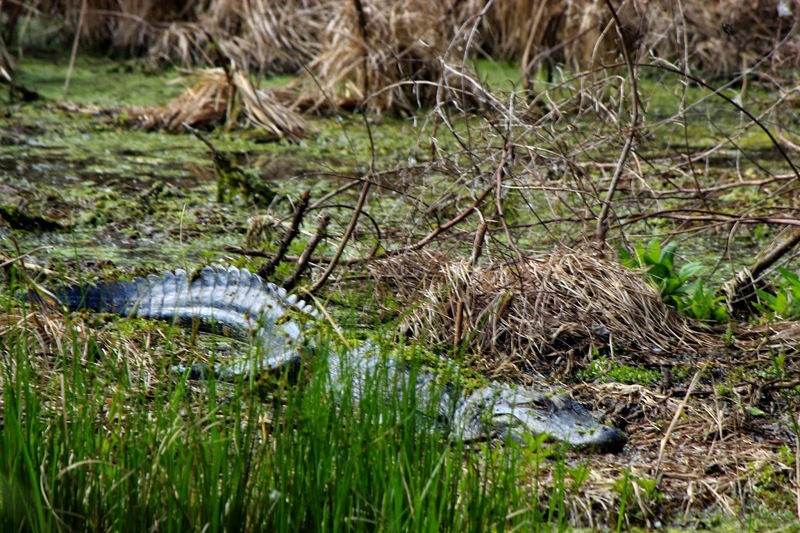 The alligator at Largo Central Nature preserve can usually be found near the beginning of the boardwalk around the retention pond. He makes himself scarce on the cool days, but when it heats up into the warmer 60's he comes out to sun himself. At Sawgrass Lake Park, I have seen the young alligators out even in jacket weather.